October 28 2017, 12:23 a.m.
No other incident during Standing Rock better illustrates the collaboration between police and private security in suppressing the NoDAPL movement. One year ago today, on October 27, 2016, hundreds of law enforcement officers descended on a small resistance camp that stood directly in the path of the Dakota Access Pipeline, forcibly evicting residents and arresting 142 people — more than on any other day in the 11-month-long Standing Rock struggle. Seven people, all Native American, were slapped with rare federal charges, and additional cases stemming from the raid continue to move through the North Dakota legal system. Although it was not the most violent confrontation between the pipeline resistance and law enforcement, no other incident better illustrates the collaboration between federal, local, and state police and private security in suppressing the NoDAPL movement, nor would any be as symbolic of the historic proportions of the native-led fight. A year later, two other pipeline fights — against Enbridge Line 3 and Keystone XL — are brewing nearby in South Dakota, Nebraska, Wisconsin, and Minnesota. As indigenous leaders in those fights stand again on treaty rights against the pipelines, the October 27 standoff and the eviction of Treaty Camp have become a roadmap for both water protectors and law enforcement as they prepare for battles to come. The Intercept has obtained hours of police bodycam and aerial footage, as well as photographs, audio recordings, and a large set of incident reports describing police activities during the October 27 raid. That material, selections of which appear below, along with interviews with more than a dozen water protectors who were present that day, paints the most detailed picture yet of the most dramatic standoff between indigenous people and U.S. police forces in over four decades. A view of the 1851 Treaty Camp ahead of the October 27, 2016 police raid that put an end to it. Drive north on Highway 1806 through the Standing Rock Sioux reservation, cross the Cannonball River, and you enter unceded treaty territory — land indigenous people never agreed to relinquish. Immediately north of the river begins federal land controlled by the U.S. Army Corps of Engineers, where the largest Dakota Access Pipeline resistance camp, known as Oceti Sakowin, was located for seven months beginning in August 2016. Just north of there, the Dakota Access Pipeline now crosses the highway. Energy Transfer Partners bought the property on either side of the road, known as Cannonball Ranch. The legality of its sale to ETP is questionable under a North Dakota law that blocks corporations from buying agricultural land. But North Dakota law aside, native historians say, that land should never have been for sale: It belongs to the Sioux. If the Fort Laramie treaties in 1851 and 1868 had been honored, the site would still be controlled by the Great Sioux Nation. For water protectors, the fight against the pipeline was only the latest episode in two centuries of native resistance to U.S. government incursion into the northern Great Plains, part of a lineage that includes the 1876 Battle of Greasy Grass, where indigenous people defeated the U.S. 7th Cavalry in defense of their treaty rights to South Dakota’s Black Hills; the 1890 massacre at Wounded Knee, where as many as 300 Lakota people were killed by U.S. soldiers; and the 1973 occupation of Wounded Knee, where armed members of the American Indian Movement faced off with federal agents in protest of a corrupt local government and the U.S. government’s legacy of broken treaties. This latest confrontation was not supposed to involve guns — the water protectors were mostly committed to unarmed opposition — but it did invoke that bloody history. Law enforcement planned to evict the Treaty Camp on October 26, but a soupy fog descended on the hills. A small envoy of local, state, and federal officers drove toward the blockade that water protectors had erected on the highway to keep police out. They were greeted by Mekasi Camp Horinek, a member of the Ponca tribe from Oklahoma, whose uncle Carter Camp helped organize the Wounded Knee occupation in 1973. He was joined by several other pipeline opponents. The negotiators talked in circles, with Horinek and his companions returning repeatedly to the issue of the Fort Laramie treaties, which law enforcement repeatedly argued was not their jurisdiction. “So is this about water and oil, or is this about 140 years?” Cass County Sheriff Paul Laney replied, referring to the Great Sioux War, which ended with the U.S. government’s annexation of the sacred Black Hills. “Everything. All of that. We’ve had enough. We’ve had enough,” one of the water protectors said. “That’s your final word?” Laney asked. “That’s the final word,” Horinek replied. Police recording of negotiations between pipeline opponents and law enforcement officials on Oct. 26, 2016. Reflecting on that day nearly a year later, Horinek explained that the experiences of native people 140 years ago are impossible to disentangle from the poverty and environmental contamination seen across Indian Country today. Law enforcement officials tear down a tent at Treaty Camp on Oct. 27 2016. In the weeks preceding the founding of the Treaty Camp, direct action had become a daily ritual for residents of the resistance camps nearby. On some mornings, convoys of cars carrying water protectors would weave through the hills toward construction sites or government buildings identified as protest targets. A team of lawyers stood at the ready to assist those who were arrested and detained. But the temperature was dropping below freezing at night. Winter would doubtlessly sap energy from the movement. Meanwhile, scouts and drones sent out into the hills were returning with reports that the construction was getting closer to the highway crossing and to the river. Water protectors felt a growing sense of urgency. Joye Braun came to the NoDAPL movement already a veteran pipeline fighter. She was involved with a Keystone XL opposition camp on South Dakota’s Cheyenne River Sioux reservation. After Obama’s State Department denied Keystone XL a key permit, putting it to a halt, Braun became the first person to pitch a teepee at the first DAPL resistance camp, called Sacred Stone. According to treaties signed between the U.S. government and indigenous nations in the 19th century, Cannonball Ranch — the land DAPL eventually purchased — should have never been for sale. That’s because the pipeline route cuts through land that the 1851 Fort Laramie Treaty, intended to buy peace and safe passage for settlers moving through the area, established as belonging to the Sioux. In 1868, the treaty was superseded by a second treaty that established the Great Sioux reservation. But while that treaty created a reservation whose borders were further south, it also determined that the land DAPL bought was “unceded Indian territory” — a designation that holds to this day, despite the beliefs of some U.S. elected officials. “Unceded land is land that was never given over or conceded; it’s essentially stolen land,” Nick Estes, a Lakota historian, told The Intercept. Cannonball Ranch, specifically, was “illegally settled,” Estes said, and acquired as private property through squatters’ rights. Only an act of Congress can abridge a treaty, opening unceded territory for non-native settlement, Estes said — but that never happened with this particular land, the status of which remains disputed. Disputes over unceded land have arisen before — most notably over the Black Hills, which resulted in a 1980 Supreme Court decision that offered a monetary settlement as reparation for the settled land — but no actual land restitution. Indigenous people have refused to take that money. Native American activist Joye Braun — the first person to pitch a teepee at the first DAPL resistance camp — talks to The Intercept about the fight for her native land. On October 23, Braun moved her teepee to what would become the Treaty Camp. But she never doubted that a police confrontation was imminent. Two days earlier, police had moved their staging area from the Mandan airport, a 40-minute drive from the heart of the protests, to Fort Rice, 10 minutes away. Law enforcement officials training in darkness. To Morton County Sheriff Kyle Kirchmeier, whose department led the law enforcement response to the pipeline protests, treaty enforcement is the federal government’s job. “I understand the treaties and what that’s about,” he told The Intercept. Nonetheless, Kirchmeier would lead some 300 officers to clear the Treaty Camp on October 27. Morton County Sheriff Kyle Kirchmeier tells The Intercept about the various law enforcement agencies that came together on Oct. 27 and the tools they used, including LRADs, Tasers and OC spray. It wasn’t just local police that would join the operation. In August, North Dakota’s Department of Emergency Services activated the Emergency Management Assistance Compact, which allows states to import police from other states. On October 27, 97 out-of-state officers participated in the raid – approximately a third of the force. An array of federal agencies was involved, too. Ninety federal law enforcement officials from various agencies had taken part in monitoring the DAPL resistance by October 23, police records show — and 14 of them took part in the October 27 operations, according to police. Meanwhile, the law enforcement Emergency Operations Center in Bismarck, established to respond to the DAPL protests, hosted daily meetings that included intelligence officers from the FBI, Department of Homeland Security, Bureau of Indian Affairs, and other agencies. Still, after more than two months of DAPL demonstrations, police felt under-resourced, frustrated that the federal government refused to take control of the situation by making a final decision on the pipeline or sending more support. This would be one of the largest operations the multi-agency force had carried out. “The biggest concern is that there were several hundred individuals that were camped out on private property, and that could not continue,” Sheriff Kirchmeier said. Treaty Camp would be defended at two front lines: on Highway 1806, where water protectors set up a barricade directly north of the camp, and on County Road 134, a dirt road that bisects the highway south of Treaty Camp and north of Oceti Sakowin Camp. Water protectors suspected police would use the dirt road to cut off access to the larger camp, where thousands of water protectors had stayed behind. Desiree Kane, a Miwok freelance reporter who stayed at the resistance camps from May to December 2016, approached County Road 134 as the standoff with police began. Within hours, barricades were set ablaze in between the water protectors and the police. In an attempt to halt advancing police, water protectors blocked County Road 134 by setting a makeshift barricade on fire. At Highway 1806, however, arguments had broken out about whether to allow police to extinguish a barricade fire that was sending smoke billowing into the hills. Horinek backed away from his cry of “No surrender; no retreat.” Despite objections, he pushed people back, allowing police to inch forward. “I think had we not slowly pulled back that there would have been loss of life on October 27, 2016,” he said. Soon, law enforcement began deploying pepper spray, Tasers, rubber bullets, sound cannons, and batons against water protectors. Frank Archambault, a Standing Rock tribal member and member of a camp security group, found himself pleading with water protectors to avoid provoking police. “We’re all the time trying to stop them from throwing stuff, so they don’t have an excuse to shoot those people,” he said. Pipeline protesters throw objects at law enforcement agents, who respond with pepper spray. Allison Renville, a member of the Great Sioux Nation from South Dakota, saw historical trauma playing out in the mixed reactions of her fellow water protectors. “A lot of it had to do with fight or flight, a natural response when you’re threatened that bad that you’re waiting to die,” she said. “When I went out there, I went out with the mindset of, I’m going out there to protect and stand for what is right, and if that costs me my life, then so be it,” said Elih Lizama, an Apache and Mayan pipeline opponent from California, who joined a group of horse riders assigned to patrol the hills that made up the DAPL property. But he didn’t equate readiness for death with violence. Private security firm TigerSwan shared this intelligence update with law enforcement a day before the raid of Treaty Camp. TigerSwan, a firm made up of former military personnel hired by Energy Transfer Partners to manage its sprawling security operation, organized the daily briefings and made sure police knew what was being discussed. Public records show that Mercer County Sheriff Dean Danzeisen and Morton County Sheriff’s Deputy Lynn Wanner received the presentations. A spokesperson for Morton County said that they only used the information from briefings for “situational awareness.” Mercer County did not respond to requests for comment. TigerSwan and Energy Transfer Partners did not respond either. “Did we talk to private security? Absolutely. We used them as a resource just like many other resources that are out there,” he said, listing asset sharing that included police using private security’s snow mobiles and ATVs for their operations. Police used DAPL security’s ATVs to drop off a sniper near the County Road 134 barricade. On the day of the Treaty Camp raid, private security personnel also provided police with extra hands. As the line of police moved down Highway 1806, Alyssa Beaulieu, of the Red Lake band of Ojibwe in Minnesota, and a handful of others jumped a fence and started running though the field where pipeline construction was underway. She was quickly surrounded by men in plainclothes. “It was just a prideful thing. I could have run, I could have gone back to camp,” she added. “But I had a moment.” She and another protester were tackled to the ground by four men, including two DAPL security guards. Private security assisted police in attaching zip ties around her wrists. Alyssa Beaulieu is arrested by police assisted by DAPL security guards. A spokesperson for the Morton County Sheriff’s Department confirmed that the two men (shown in law enforcement video footage in the brown coat and the camouflage bandana) helping handcuff Beaulieu and her companion were DAPL security officers. A selection of law enforcement reports concerning the events of October 27, 2016. Deeper in the hills, horse riders were facing off with police and private security in ATVs, in trucks, and even in the air. Lizama had been scouting on horseback in the plains for days, watching the activities of police and private security, “We knew they were dropping people off to spy on people from the hills,” he said. Where horses couldn’t go, water protectors sent drones to conduct reconnaissance. But by the day of the raid, the aircraft had been officially banned. On October 23, the day the first tents went up at Treaty Camp, North Dakota officials submitted a request to the Federal Aviation Administration for a rare “temporary flight restriction” covering the airspace above the pipeline resistance. The no-fly zone was in place between October 25 and December 13 — allowing “only relief aircraft ops under direction of North Dakota Tactical Operations Center,” according to the FAA. But on the day of the raid, DAPL’s helicopter continued to fly above, alongside North Dakota Highway Patrol aircraft, officially becoming part of the law enforcement’s eviction effort. According to Kirchmeier, a law enforcement officer always accompanied DAPL personnel in the private aircraft. From above, police and private security captured footage of the raid and the action in the countryside, some of which would be used later in the prosecution of water protectors. Security footage shows horseback riders facing off with police and private security in ATVs, trucks, and helicopters. In the distance, smoke billowed, as a bulldozer was set on fire in an area off 1806 where DAPL stored its equipment. The group blocking County Road 134 had retreated. A herd of stampeding buffalo is seen from a security helicopter. A white truck careened down Highway 1806 toward the big Oceti Sakowin camp, where thousands of DAPL opponents had stayed as the smaller front-line camp was evicted. “All of a sudden a guy with a gun comes toward us,” said Mike Fasig, a member of the camp security group. Fasig thought of the camp full of women, elders, and children, imagining the melee that would follow if the gunman opened fire near the police line. Fasig and another security group member, Israel Hernandez, jumped into their respective vehicles and sped toward the gunman’s vehicle. Mike Fasig tells the story of a white truck driven by an armed man that came careening towards Oceti Sakowin camp in this interview with Intercept staff. The man at the wheel of the white truck was Kyle Thompson, a guard for Leighton security, one of about half a dozen private security companies working to guard the pipeline. Although Thompson was ex-military, Leighton mostly hired off-duty cops, including, said company president Kevin Mayberry, officers from the Morton County Sheriff’s Department and other local agencies. Morton County told The Intercept that Leighton had requested personnel to watch an equipment yard. “The sheriff made the deputies aware of the job opportunity to serve as private security in their off hours (essentially, a second job – they were paid by Leighton). It was only for 12 days from Aug. 5-17 because once the protest began, the deputies were needed to respond to that activity and worked plenty of overtime with that,” said a spokesperson. For the water protectors, private security had been a constant presence since August. Scouts like Lizama encountered them dressed in ghillie suits, which are used by the military to disguise soldiers as piles of grass, hiding in the countryside at night. They followed drivers around. Rumors of security infiltrating the camps — later proven to be founded — had circulated for weeks. The sudden appearance on October 27 of an armed private security officer was the manifestation of a threat they had always felt was lurking. In an interview with The Intercept, Thompson said he drove toward the camp responding to a message that equipment was on fire near Highway 1806. He said that as he approached the side road where the burning construction equipment was located, wearing a red bandana to disguise himself as a water protector, he saw a crowd of people. “I got super paranoid and nervous. I was security, and in a sense behind the lines,” Thompson said. Sitting next to him was his AR-15 semi-automatic rifle. Mayberry said that his company largely stayed away from protesters and did not deploy disguised guards. “We had no guards doing that, so if he was doing that, or if somebody was doing that, that’s on him; that has nothing to do with our company,” he said, adding that non-law enforcement were not supposed to be armed. “We didn’t even know he had a gun with him,” he said. Kyle Thompson’s AR-15 semi-automatic rifle. Water protectors noticed the unfamiliar truck and asked Thompson who he was. “Brian,” he lied. But the water protectors didn’t miss his rifle. “They were like, stop that truck. If they stopped me and got into it, I realize they would have known who I was. I don’t know what they would have done,” Thompson recalled. So he sped down the road, steering into the ditch to avoid pedestrians. As he drove, people attempted to block his path. “If he would have shot those rounds off, the police would have killed us,” said Horinek. As was the case with many other water protectors, his thoughts immediately went to Wounded Knee, when a single shot fired as the U.S. 7th Cavalry descended on an encampment of Lakota people sparked a massacre. As Thompson’s white truck neared the Oceti Sakowin camp, Fasig veered left, ramming Thompson to a halt. Thompson emerged from the vehicle holding his AR-15, finger on the trigger. The crowd screamed at him to put down the gun. He backed into the pond on the side of the road as water protectors, one armed with a knife, surrounded him and attempted to disarm him. Pipeline opponents set his truck on fire. While Thompson was eventually disarmed and arrested by officers with the Bureau of Indian Affairs, he was never charged. Instead, it would be Fasig and two others who tried to disarm Thompson who would face felony charges. Many of the 142 people arrested at Treaty Camp that day told The Intercept that they were held on the highway in handcuffs for hours, stripped of their clothes, and had identification numbers written on their arms. Eventually, they were loaded onto school buses, some barefoot and in their underwear, and taken to Morton County, where they were packed into dog kennels before being shipped to jails across the state, including some several hours away, without being told where they were going. Upon release, many returned to find that their cars had been impounded and their tents and property dumped on a pile on the ground. Hock, who was pulled out of the sweat lodge, said he returned to find his belongings, including a sacred pipe, had been urinated on. The spokesperson for the Morton County Sheriff’s Department confirmed that “fenced cubicles” were used on that day but stressed that “all essential services” were provided to those temporarily held in them. She added that “the inmates had the number written on their arms so it couldn’t be easily removed,” as had happened on previous occasions, and noted that those arrested were only allowed to keep one layer of clothes for safety reasons. “If they didn’t want that layer to be their long underwear, they had the option of going to the restroom to remove the underwear and change into their pants,” the spokesperson wrote. In all, over the course of seven months, 838 people faced charges in at least 427 separate DAPL-related criminal cases in North Dakota, according to the Water Protector Legal Collective, a group of lawyers representing many of those defendants. As of late September, 427 people’s cases remained open, 289 were dismissed, 105 resolved through plea deals or other pretrial diversions, and 10 resulted in convictions. Two more people were convicted and imprisoned last week — the first to receive a jail sentence in connection to last year’s protests. Timothy Cominghay, a member of Freshet, a native collective that’s been providing support to activists returning to North Dakota for court dates, talks to The Intercept about the Oct. 27 arrests. The most serious charges involve incidents that took place on October 27. Five people accused of helping set the County Road 134 bridge on fire — as well as one person accused of setting a Highway 1806 barricade ablaze — were charged with “commission of a civil disorder” and “using fire to commit a civil disorder,” federal charges that carry a mandatory minimum sentence of 10 years in prison. 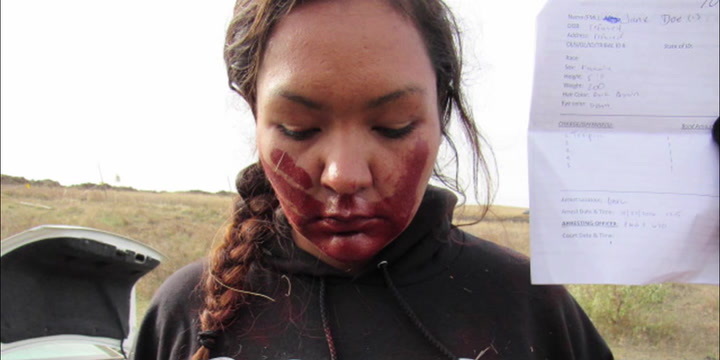 And a woman named Red Fawn Fallis faces three federal felony charges — after a gun went off when officers tackled her to the ground on the day of the Treaty Camp raid. She faces the possibility of life in prison. Water protectors chased DAPL security guard Kyle Thompson into the water and surrounded him, in an effort to disarm him. Months after he drove his truck toward the Oceti Sakowin Camp, Thompson, the private security guard, emerged as an unlikely ally to those facing charges for attempting to disarm him. Following that interview, a state prosecutor dropped charges against Brennon Nastacio, one of the water protectors that had attempted to disarm Thompson in the water, saying that Thompson’s statements had raised “significant doubt as to whether the state could meet its burden of proof with regard to the charge of terrorizing.” According to an agreement with the court, Fasig and Hernandez will see their charges dismissed in a year if they pay fines and commit no crimes. Most water protectors and police have doubled down on their resolve — and new pipeline fights have picked up across the country. Joye Braun is preparing for the next treaty stand. The newly revived Keystone XL Pipeline would swing just outside the boundary of her Cheyenne River Sioux Reservation and awaits a major decision from Nebraska. If the Keystone XL Pipeline begins construction, Braun will pitch a teepee at another frontline camp. Additional Reporting: Henriette Chacar. Research: Sheelagh McNeill.